It snowed again here today and I am not happy. Here is something to cheer myself (and hopefully you) up. To be honest, anything pink almost always cheers me up. 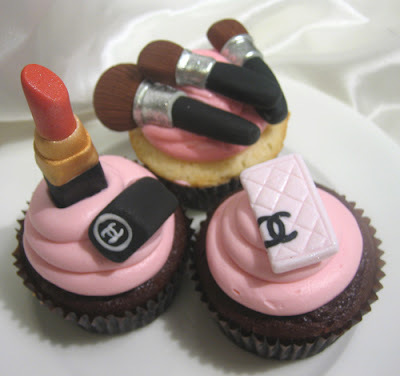 Chanel cupcakes from Cupcakes Nouveau. Mother nature, are you there? It's me, Veronica. CHILL WITH THE SNOW. BRING ME SOME SUNSHINE AND WARMTH. Thanks so much. On the bright side I had an awesome weekend I got to spend some time with a girlfriend I had not seen for a while. It was recently my best friend's birthday, so we had a party at her house last night then went to some shoebox club upstairs on top of a pub and had a blast there as well. I took a bunch of pictures but you only get to see one for now because I am waiting for my friend to upload some that she took so that I can post all of them for you guys. I start a new job tomorrow! So excited it should be amazing! Details soon. I recently bought two pairs of black pumps because I need to wear heels while I am working, the girls at my work dress so cute, I can't wait to show you guys! I also bought some accessories to spice up the plain black. I needed something to do to avoid studying for my exam tomorrow so I made a shopping list of just a few items I would love to purchase in the upcoming future. The Miu Miu baithingsuit is amazing! I love the colour, the shape, and the little white bow accent. Perfect for me but I don't know if I would like the tan lines. Oh summer, please come faster! I love this outfit! It is chic and casual, with just the right amount of colour for me. I love her entire spring line it is to die for! Out with some girlfriends! More pictures will be up soon, my outfit has two cut-out mesh sides that I am thinking about removing from the dress so that skin will be showing there. You will see what I mean soon! Exam tomorrow as well (of course I am procrastinating by doing this blog) but it is a blessing in disguise that my friend has an exam tomorrow too, and she's much better at actually studying so she hasn't put her pictures up yet. Otherwise I would be on here for much longer and posting way more pictures! OH MY GOSH! how cute are those cupcakes. i wouldn't want to eat them. too pretty. i cannot get over the cupcakes! !1 such a brilliant idea!! those cupcakes looks so amazing! i am having a giveaway on my blog, that is perfect for spring&summer! a RAD BIKINI by a young Mexican designeer! check it out, you wont be disappointed ♥ i promise! OMG those cupcakes are amazing!!!!! !